The classic game of billiards has over time given birth to a whole series of small table games, each remaining true to the basic principle of ‘potting’ a ball in a hole or a pocket. What we offer here is a variant that’s both unusual and fascinating. For 2-4 players. Base of steel components, MDF fibre board with a slightly curved playing area of beech ply wood. Central section, flippers and surrounds of solid red beech. Playing figures and 2 balls of stainless steel, Ø 1.5 cm. Height 9.5 cm. Width 52 cm, depth 52 cm. Weight 7,7 kg. Suitable for children of 3 and over. ‘Spirobille’ – a game that offers high-speed fun. Spirobille is a simple game based on the billiards principle. A steel ball is ejected from the central section and rolls over the field of play in the direction of one of the players. His job is then to use a flipper to get the ball away from his own goal as quickly as possible, and shoot it into the goal of a competitor. All this has to be done at top-speed – a fashion that came in with the 1950s flipper games. (The original game, Jeu de Marteau, the ‘Hammer Game’, originated in France; here, the ball had to be ‘manoeuvred’ towards the opponent’s goal with a whole series of ‘hammer’ strokes.) Spirobille is most fun with four players, but can just as well be played with two or three players, in which case the unoccupied goals are closed off by steel bars. Spirobille is made in Switzerland, and is part of the standard range of so-called ‘Ludotheques’ (game libraries, so to speak), and as such has to conform to the demands and standards of the hiring and lending business. For this reason it’s very solidly constructed. 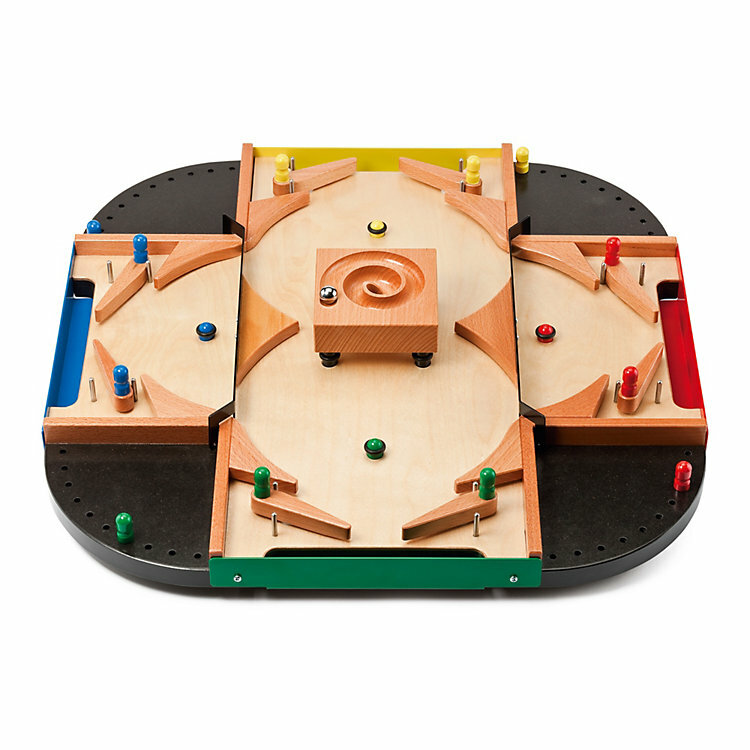 You’ll find four screws under the base that can be adjusted to ensure a level field of play. The flipper levers can if necessary be tightened with the enclosed spanner.